Desires of the heart – There is a second problem with operating out of our hearts (being connected). Most of us have experienced a failed dream, so we’re not particularly motivated to get all excited about a new dream. Our hearts have had a bad experience. When I talk to people about going through the heart plan to discover where their personal desires overlap with God’s heart, it’s surprising how many times I get the dial tone. It makes perfect sense intellectually; they just can’t make themselves do it. Those past experiences with failed dreams are just too big. For most of us, we are not simply setting our hearts on God, the Kingdom, His purposes, or my own heart’s desires; we’re having to “reset” our hearts, from an old belief about ourselves, to a new one. 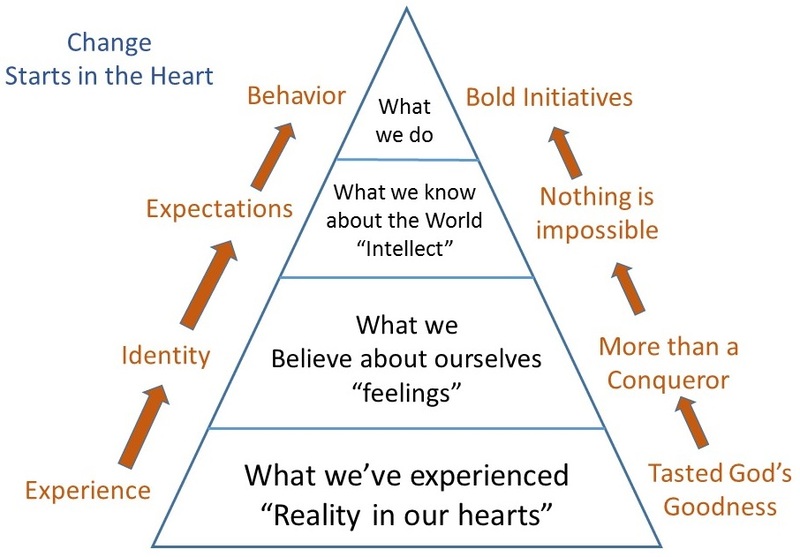 Resetting our hearts – The beliefs in our hearts (or subconscious) are deeply rooted in past experience. It really does take “an experience” to make a change. Our hearts need to know why we should give up an old heart belief for a new one. This trade can only happen when we can identify the present belief and connect the dots the past experience that defined it. Trading up for a different belief implies that it’s really better and that it’s coupled with an experience that makes it real. “So, what experiences are you talking about, John?” It’s always some kind of experience with the Holy Spirit. In the course of conversation we can identify the desired change and try to make connections with past experiences. When we touch the right one, everyone can feel it. Jesus, Himself, turns the lights on and it really is a prophetic experience. It doesn’t even matter if the person is saved yet or not. The next experience happens when we touch the new belief we’re trading up to get. When we land on the dream that resides in my heart and God’s heart… we can feel it again! As a coach or helper, I don’t have to project anything. I can help people explore (stumble through) options and possibilities, and simply watch for the Lord to confirm it in our hearts. It’s hard to get through a conversation with the Lord’s grace without tears. It’s a personal experience with amazing grace. The degree of difficulty – Why is it hard to be transparent and dump old wounds and embrace new dreams? Those dreams represent our land in the Kingdom, our destiny, our ministry. It’s exactly the sphere of warfare for which the enemy most contends, because those dreams are your calling. You’re no threat to the devil and no blessing to nations until your dream starts coming true. That’s why we guard our hearts. The desires God that put there are treasures in the Kingdom. Notice the context. When our hearts are set in the right direction, our behavior naturally flows from our hearts in the right direction. Intellectual self-discipline is grossly over-rated. God designed us so that our behavior naturally flows from the desires of our hearts. Being connected and living out of our hearts is the genius of life in the Kingdom. Even when it’s as hard as Paul sitting in prison writing letters, it’s fun knowing that we are co-laboring with the Father to bless nations. Most of us have it better than Solomon, but whether our cup overflows or gets emptied out, we still hear the music, we’re still dancing, and it still feels like a party. That’s the why of setting our hearts on the Kingdom. We’re bringing heaven to earth.